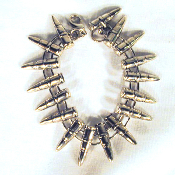 Big Funky Chunky Punk BULLET PEWTER UNISEX BRACELET - Gothic Heavy Metal Rock Charm Novelty Costume Jewelry - Silver-tone Pewter Alloy Antique-Finish, Loose cuff-style, Multi-Bullets Bead Charms, Cool Novelty Bling, approx 8-inch (20 cm) long x 1-inch (2.4 cm) wide. Unique Gift for Police Officer, Cop, Security Guard, Biker, EMO, Rocker! *Metal unknown. Possibly nickel-plated. *Dimensional top side only. Flat charm back.